Art Blakey's recording output decreased dramatically in the latter half of the 1960s as jazz in general fell on hard times. In fact, the present album Live! (New World at Slug's) is the only album Blakey recorded as a leader in 1968. 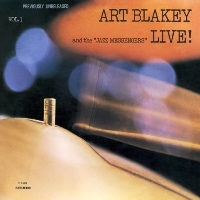 However, that doesn't mean he and the Jazz Messengers were not producing good music, as this fiery live album attests. The three horn players on the front are the underrated trumpeter Bill Hardman, the young and upcoming (at the time) sax player Billy Harper, and Julian Priester on trombone. Hardman's solos are brilliant, and the post-Coltrane style and energy of Harper is incredibly powerful. An interesting side story: This album was originally released by Trip Records, known as an inexpensive reissue label. Long-time jazz producer and promoter Fred Norsworthy was in charge of the label and released this original album without an approval from the parent company. Reportedly he was fired because of it. This is an exciting and important album that captured the Jazz Messengers making fiery music in 1968! Recorded live at Slug's in New York City on August 18, 1968. Stereo. This reissue CD released in Japan by SSJ Records in 2015.